This recipe for Grilled Caesar Salad is out of this world. The lettuce and bread are cooked on the grill for optimal flavor. This is my daughter’s favorite salad recipe. This is a sponsored post for Red Baron®. All thoughts and opinions are my own. Thanks to all the readers and companies who support Cravings of a Lunatic. Grill season is in full swing and this girl could not be happier about it. I’ve been out on the deck grilling up a storm lately. My deck is my happy place in spring and summer. I grill year round, even when there is 3 feet of snow on the ground. However, even a die-hard griller like me prefers to grill when the weather is gorgeous and sunny. We cook everything on the grill. From meat to dessert and everything in between. 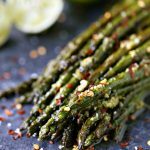 Anything you can cook in an oven or on a cooktop can be made on the grill. On this particular day, I was hanging out with my family. We had a serious craving for pizza so we tossed some Red Baron pizzas on the grill, along with some salad. My daughter is a huge Caesar Salad fanatic. She could eat it every day, and often does. She loves hers with bacon, lots and lots of bacon. I’m always happy to oblige when it comes to bacon. She also happens to be a HUGE pizza fanatic. We eat pizza on a regular basis. It’s something every member of the family loves. So we picked up a ton of Red Baron Pizza at Sam’s Club. Did you know you can cook Red Baron Pizza on the grill? You can and you should!! These little beauties cook wonderfully on the grill. Crispy on the bottom and the melty cheese on top. Yum, right? I know. I love pizza SO much. Knowing I can cook it on the grill so I don’t heat up my house during the summer months makes me super de duper happy! I could eat pizza every day. It’s pure comfort food. We picked up a few extra boxes of Red Baron pizza at Sam’s Club while we were shopping the other day. We knew we needed lots of pizza on hand. Why? Our son is coming down to visit soon. That dude can eat his weight in pizza. He’s always hungry so having something quick and easy on hand makes all the different in the world. What I love about cooking pizza, salad, and anything else on the grill is it doesn’t heat up my house. Our air conditioner blows and not in a good way. Cooking indoors is a no-go in summer. I cook everything outdoors on the grill from about April until October. It just gets too hot in the house otherwise. So, I love things like this that can be cooked quickly and easily. For the salad, you can serve it one of two ways. You can serve it with leaves whole as pictured right above. Or you can chop the lettuce if you prefer that way more. It’s great both ways. My daughter likes hers chopped. She also likes her dressing drizzled on rather than slathered on and mixed in. All ways are acceptable in our world. We’re open-minded like that. Nothing beats a great salad with pizza. 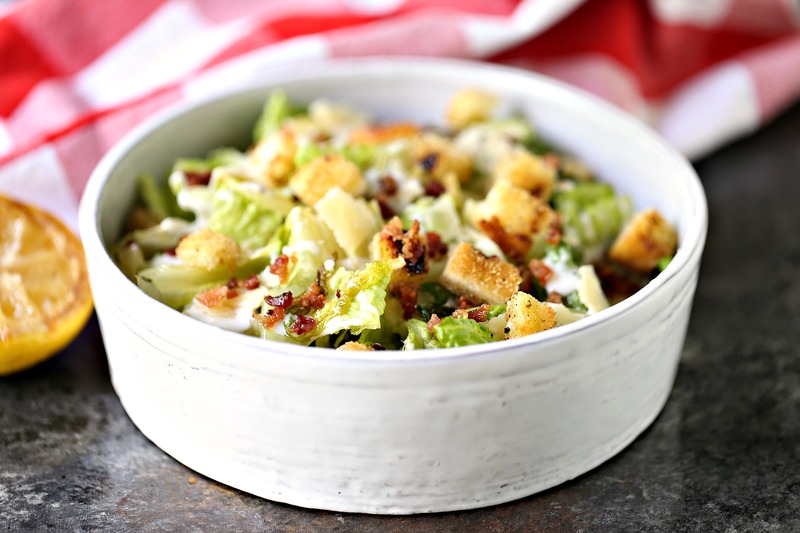 I highly recommend whipping up some Red Baron pizza and this Grilled Caesar Salad. 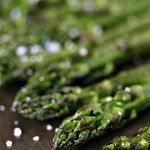 Make your own dressing or use store-bought. No judgment. 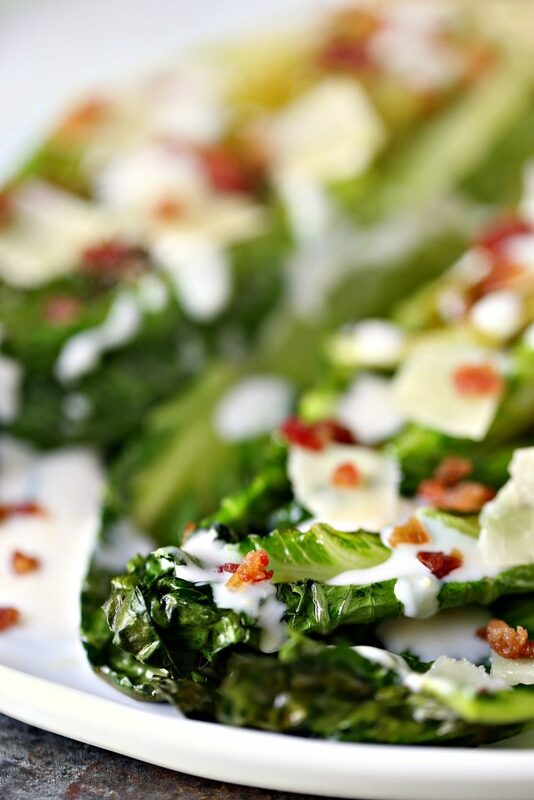 I’ll be sharing my recipe for Easy Homemade Caesar Dressing next week. I think it’s the bomb. My daughter prefers store bought. How’s that for honesty?! Preheat grill to medium heat. Be sure grill grates are cleaned and oiled. Cook bacon on grill in cast iron pan till perfectly crisp. Remove, drain excess grease, then chop into fine pieces. Set aside. Cut romaine hearts in half, lengthwise. Place in a long shallow bowl. In a small bowl combine olive oil and lemon juice. Whisk. Pour over romaine hearts. Toss to coat evenly. Place garlic toast on grill. Cook until golden brown with grill marks, flip and cook the same way on the other side. Remove with tongs and set aside. Place romaine hearts on grill, cut side down and cook for about 2 minutes. Flip and cook for another 2 minutes. Remove with tongs. Set aside. Chop garlic toast into small pieces. Optional: I high recommend cooking the garlic toast croutons once they're cut. Cook them in the cast iron pan you used for the bacon. Make the most of that bacon fat. 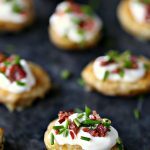 It brings a whole other level of deliciousness to the garlic toast croutons. You don't have to but it adds more flavour. 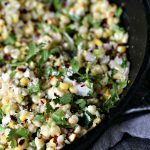 Just cook in the cast iron pan till all sides are golden and toasted perfectly. You can either serve it with the lettuce cut or intact. Your choice. Add lettuce to serving platter or bowl. Add 1/2 the caesar dressing and toss. Add the parmesan. Add the other 1/2 of caesar dressing. Toss. Add garlic toast croutons and bacon. Serve with Red Baron Pizza and a grilled salad loving smile! Get the grill super hot! Use indirect heat to cook it. Think of your grill as an oven. If you need any help understanding 2-zone grilling or indirect heat please feel free to shoot me an email. I’m always happy to help my readers any way I can. 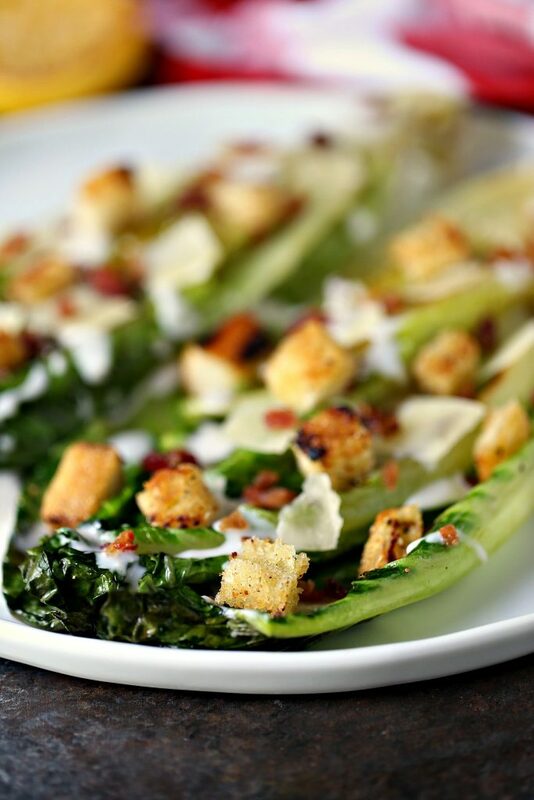 Now run to Sam’s Club and pick up some Red Baron Pizza plus all the ingredients for this Grilled Caesar Salad. Grill it up then invite me over. I’ll bring the wine! PIN THIS TO YOUR FAVOURITE SALAD BOARD! Check out my recipe index for more amazing recipes. 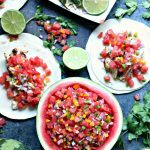 You can find more salad recipes and tons of summer recipes. I have always wanted to try grilled salad. Aahh, I wish I owned a grill!! Pizza night isn’t complete without a salad and this grilled caesar salad is perfect! Sounds so wonderful with that creamy dressing. Such a delicious companion for the pizza! Yum! This salad and bacon have my mouth watering. Pairing it with Red Baron pizza is genius! This looks like a perfect weeknight combo! Delicious salad to be paired with pizza! I, also, could eat caesar salad all day every day! This version looks really fabulous! And I just announced to my husband that we MUST try grilling pizza this summer. 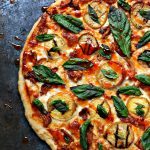 We love Friday night pizza night, but it is already way too hot to crank up the oven to 400+ degrees! 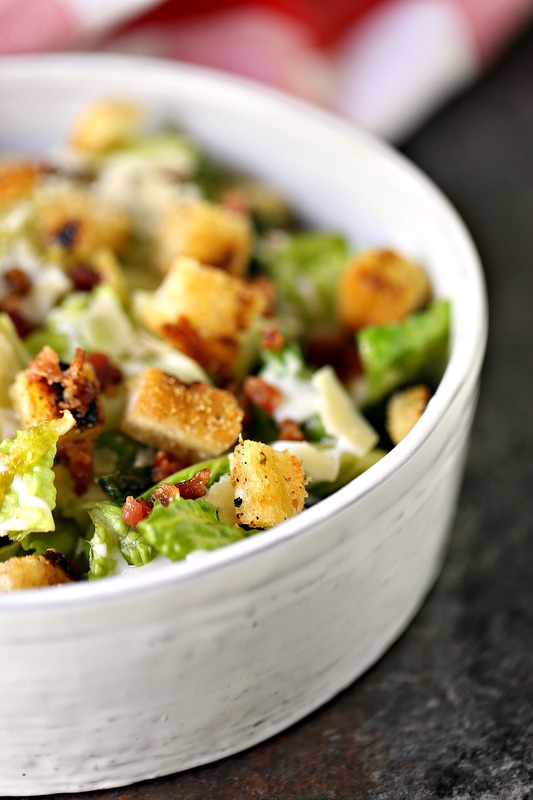 There’s nothing like a good caesar salad! I love that it’s grilled. This makes me so happy! LOVE caesar salad and pizza! Oooh, that grilled salad sounds so delicious! And pizza & salad is a combination I rarely get tired of! I love grilling season! This salad is brilliant! I had no idea you could grill their pizza- whhhhhaaaat! I’m so doing that and this Cesar salad. I love grilling romaine!! Such a game changer! 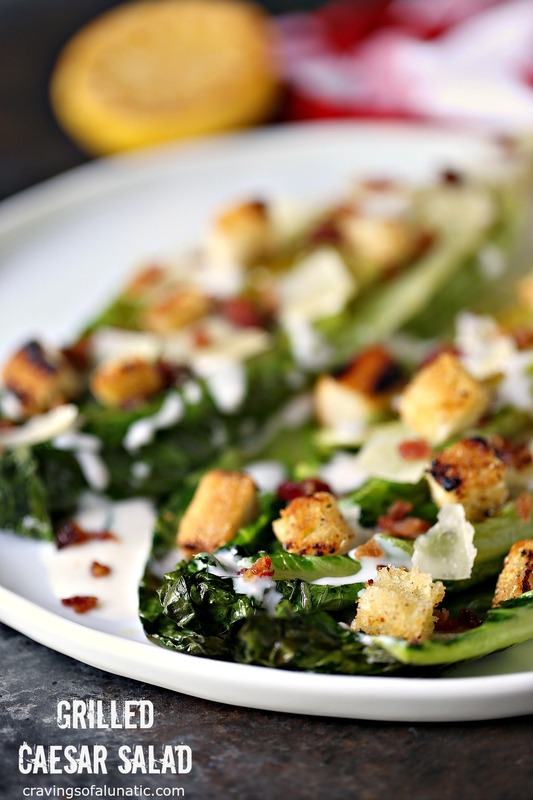 We love Caesar salad in my house and I love the idea that some parts are grilled. Sounds so good. We have not found a frozen pizza that we like, but then we have not tried Red Baron yet! We love Red Barron pizza! What a great idea! This salad (grilled!) has my name written all over it. YUM! Grilling romaine lettuce is such a game changer! That hint of smoke makes any salad that much better. I’m with K, though. I need loads of bacon on my Caesar salads. These are perfect to go with Red Baron pizzas! I’m definitely going to buy some to try on the grill. Oh, and grill this salad. Homemade dressing is a must for me, so I look forward to your recipe next week. That looks so delicious! Pinned. Wow, this looks so, so delicious! I love the grilled romaine. I love the fact that you grilled the lettuce! How awesome is that! 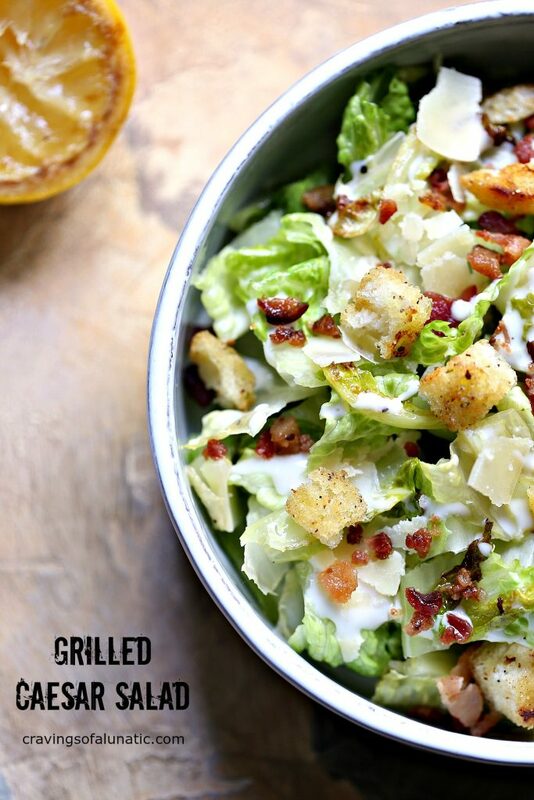 I love caesar salads but never thought to grill it! Thanks, Angie. We love grilling veggies. I think it’s because I have a sweet tooth and grilling brings out the sweetness in most veggies.